We all have some files/videos/photos which we don’t want to share with others. We don’t even want them to see our photos. This is where this post comes in handy. 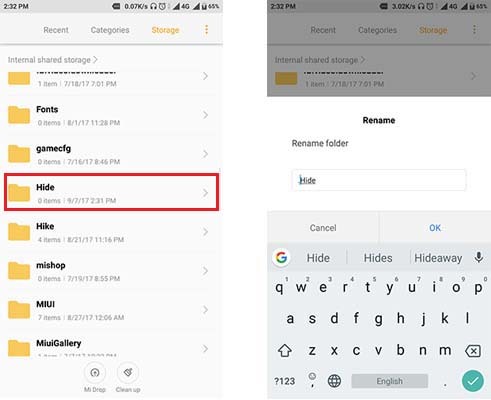 All the methods below make your files disappear from the gallery, file explorer, and any other app. This is a tricky method but works pretty well. This method doesn’t require any app. It works with any kind of Android System. First, open file manager/file explorer. Create a folder and name it anything you wanted to (let it be “Hide”). Move all the files/ photos and videos to this folder that you wanted to hide. long-press on the folder. Click Rename. Now put a “.” before the folder name (“.Hide”) and click “Ok”. That’s it. Now, this folder is completely invisible. All the photos and videos in this folder are not present/visible in Gallery or MX player. What if you wanted to access the files? Open the file explorer. Since the folder is hidden, it is not visible. Click on the three dots on top right corner and click on “show hidden folders“. Now the folder is visible. Open the folder and access the files. But still, the files are not visible in the Gallary. Click the three dots on top right corner and click “don’t show hidden folders” to hide the folder again. This trick is not so secure because anyone who knows the trick can easily click on the “show hidden folders” option and can access your private files. But there is a solution. The moment when another person opens your file manager, Root directory will be opened which contains all the folders. If he clicks on “show hidden folders”, all the hidden folders will appear on top of the folders list. But if your folder is not in root directory then it will not be listed in root directory when he clicks “show hidden folders”. You created a folder “.Hide” and put it in another folder “Notification“. When someone clicks on “show hidden folders” the folder is visible in “Notifications” but not in the Root directory. No one expects a hidden photos folder in a “Notification” folder. 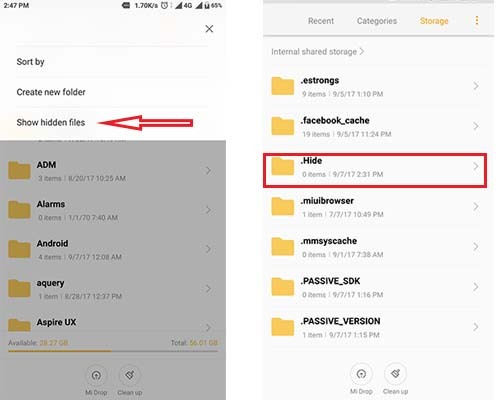 Hiding files in Android using App. The above method is simple, easy to use but, it is vulnerable(accessible). If a person opens all folders and checks all the hidden folders then he might get the hidden folder contains all your private files. After installing the app it will automatically be named as “ Audio Manager“. Open the app and long-press on the “Audio Manager“. Click on “pin code” or “password”. enter a pin and click “OK“. Enter your recovery email address. That’s it. Open the app. Tap and hold “Audio Manager” on top. A new window opens which require the secret pin(password) to open. Enter the pin to enter. Tap on photos/videos and click on “+” icon present on top right corner. Select the file you wanted to hide and click “Hide Selected Files”. That’s it. Files are now hidden in the “Audio Manager” app. It requires the secret pin to access the files. This app is similar to above trick. But it is little fun to know this trick. download the app from Play Store. The first time you enter the app it asks for a pin. 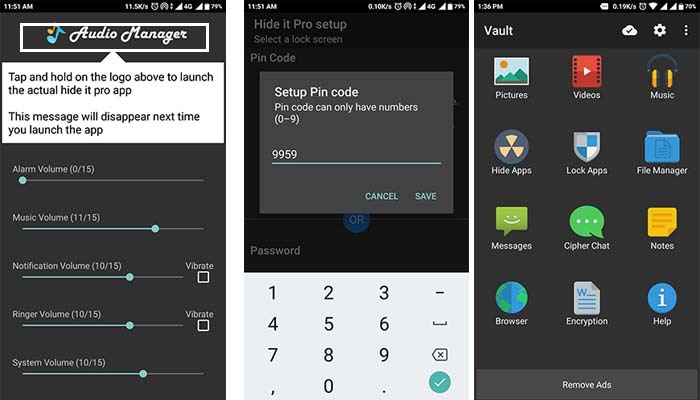 Enter the pin and hit “=” icon and confirm it by entering the same pin. 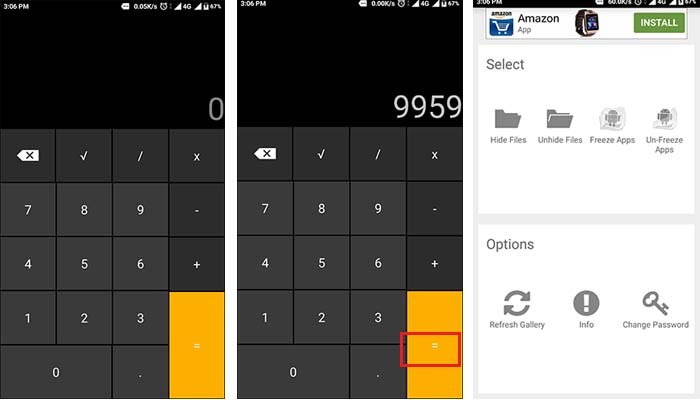 It works like a normal calculator and does the calculations. Enter the pin and click “=” to open hidden files. This app can apps too. But it requires Root access.